Jlab is renowned Medical Keratometer Manufacturer, Medical Keratometer Suppliers, Medical Keratometer Exporter, Hospital Surgical Equipments, Medical Keratometer India. Jlab are one in all the leading makers and suppliers of wide gamut of Medical Keratometer. These ar one position instrument and ar capable to live each medial while not dynamical optical system. Besides, the positive fixation permits fast activity of central tissue layer space. Our vary of keratometer works with exactness objectives and assures reliable performance. 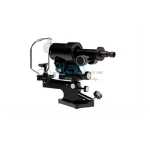 so as to produce correct results, these are equipped with achromatic lenses and therefore the twin eye level observance system facilitates horizontal alignment. Moreover, these have 2 manner adjustable head and chin rests and an easy vertical adjustment to fit patients.